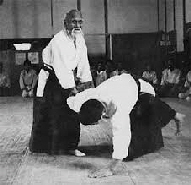 Aikido was created by Morihei Ueshiba (1883-1969), after devoting himself for all of his adult years to mastering classical styles of Daitō-ryū aiki-jūjutsu under Takeda Sokaku. Combining his experience to make this unique Martial Art, he continued its development throughout his latter years, refining it into a true Art, the Art of Peace, the way of harmony, the function of Love that leads to personal betterment and understanding of life, self, harmony and a sense of the universal. If there is competition, winner is strong and loser is weak. However, in Aikido, there is no winner or loser. We practice Aikido to improve ourselves as a person. We do NOT study how to punch or how to kick others because that is not the purpose of AIKIDO ruled by Love. We also study how to respect each other, you must always remember to respect your partners. The exercise you get training Aikido, varies with your level of experience. So for beginners, it’s fairly easy (at first) The advanced practitioners who train hard, get very fit indeed! 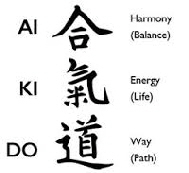 Aikido particularly increases cardio-vascular fitness, flexibility, and strength of the torso and legs. The training teaches you to relax and centre yourself; the high level of cooperation necessary between the partners teaches you to be non-confrontational and calm in all you do. These together, help to stay young in mind and body. 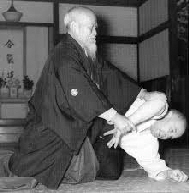 Aikido techniques are self-defense, immobilisation, control and disarmament techniques, mostly influenced by Daitō-ryū aiki-jūjutsu. Thus they must be practiced with full cooperation of the partner; the techniques are very effective, and without cooperation, physical damage can occur. The principle of Aikido is to move in flowing, harmonious ways, creating liquid, natural movements. It is beautiful to watch, and beautiful to experience the harmony between partners. Sensei (Teacher in the class) shows and demonstrates the technique or basic movement. “Onegaishimasu” (please allow me to practice with you) . each pair throws each other 4 times each, varying sides, and repeat until Sensei says “STOP”. There is no punching and kicking in Aikido. We practice the same technique repeatedly regardless of age or gender - Aikido is rather safe, the level of training is up to the Student - the more advanced Students, train harder. We start initiating the technique only if we are attacked - we never attack or we never become the one to initiate technique. That is the principle of Defense. Also, the Hakama(袴), the black trouser is very attractive for ladies!